Occupations: I teach the tabla which is a percussion-like instrument similar to bongo drums. It is used a lot in Indian folk music. I played the tabla in competition to the university level. I have been a music teacher all my adult life. I taught music to the girls at the Mata Ganga Khalsa College in India. I now work at the Khalsa School in Surrey teaching music. Recently my students came second in a kirtan competition organized by the Guru Gobind Singh Study circle. Kirtan involves chanting that is accompanied by instruments. I also teach turban tying to Sikh youth. Passions and Interests: My passion is being a Sikh, which means living life within the rules of Sikhism — a life with core values such as discipline, honesty, integrity and spirituality. To promote Sikhism in India I participated in two competitions: Mr. Singh of the Year 2009, which I won, and Mr. Singh International. These competitions have several rounds, such as casual dress, traditional dress and speeches. My speech was about the subject of female foeticide, which is a big problem in India. Music is also a lifelong passion and I love playing and learning about all types of instruments such as the flute, guitar, violin, rabab and sarod. What do people know you for? People in my community know me for being a religious person, a teacher and a good, caring person. I am also known to be able to hear a song and then whistle it from memory. Thoughts on Vancouver? I like Vancouver very much, there is no pollution and the culture is peaceful for the soul. Vancouver has a gentle sound compared to other parts of the world; there is less shouting, honking or music blaring. Vancouver is a naturally blessed city with many beautiful places. I look forward to many years here with my wife and two children. I first met Nanak while I was photographing an annual turban-tying competition in Surrey. The competition claims to be one of the biggest in North America and there are quite a few categories; age, gender and style of “dastar” — the Punjabi term for turban — which can be peaked turbans, keskis or dumallas. The judges evaluate turbans based on symmetry, folds, the overall look and whether the cloth touched the ground while tying. I noticed Nanak and thought he could win, which, to my delight, he did. 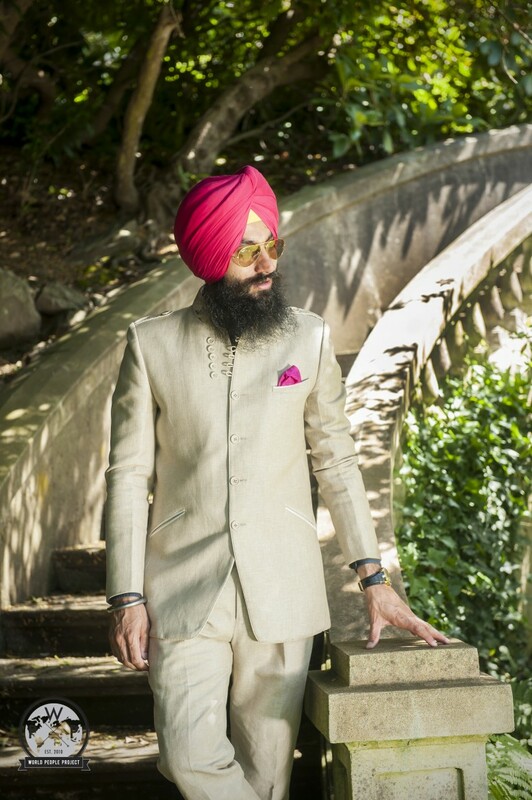 For the photo shoot Nanak styled himself in a light summer suit and, of course, a gorgeous red coloured turban.